After paying a visit to their grandparents, J and K dropped by at Taiping Zoo and Night Safari for a quick tour last Wednesday (September 9). It was the second visit for J but for K, it was his first. 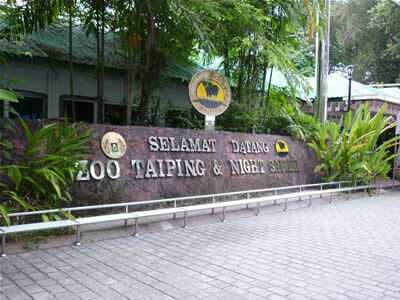 Taiping Zoo is the only zoo in Northern Malaysia. We took the Taiping Exit of the North South Expressway and the signs are clear along the way to the zoo. We made no mistakes at all and reached our destination after some 20 minutes. You won’t get lost, besides clear signage, you just go straight following the main road. When you see Taiping Prison on your right, you are about to reach the animal sanctuary. 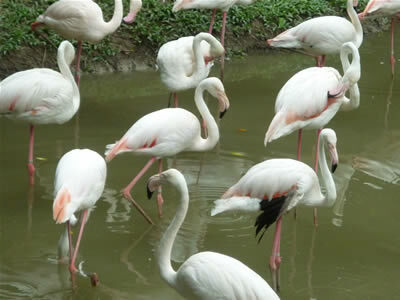 In fact, Taiping Zoo is just located next to the beautiful Taiping Lake. Once you step into the place, you will have a sense of serenity – full of trees and flowers everywhere. After paying for the tickets (Adults: RM12, Children – above 3: RM8), we entered the zoo. Our plan was to take the train for a quick tour around the zoo first. Then we checked out the zoo in details on foot. Beware there are monkeys on the loose. For personal safety, don’t feed them and do not go near them. In the zoo, the main stars are tigers and lions. 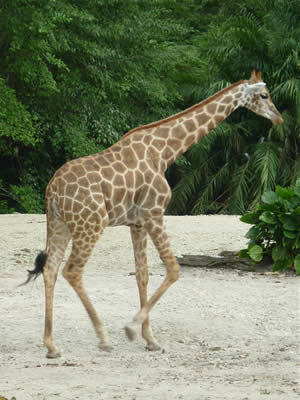 Other animals you can see in the zoo are zebras, giraffes, rhinoceros, hippo, bears, snakes, birds, etc. Some animals are grouped by geographical areas such as Australia and Africa. Since it was on a weekday, there were just a few visitors. And the best time to visit the zoo (due to hot weather) is in the late afternoon, around 4 pm. And if you want to see the night safari, you have to come at night, of course. Thinking of taking a short tour there, we – in the end – spent two hours in the zoo. By then, both J and K complained that they were hungry. With a slight change in plan, I had to go to Taiping town for dinner though I am not familiar with the historical town. We needed to have it quick so that we could reach home early. How to get there: From North South Expressway, you can either exit from Changkat Jering or Taiping. Follow the road signs that lead you to the zoo. Tips: If time permits, you can go for a walk in Taiping Lake Gardens nearby. There are some beautiful lotus flowers in the lake await you.